The Insider's Foosball Guide - Learn How To Play The Game! The game of Foosball is the table equivalent of soccer. 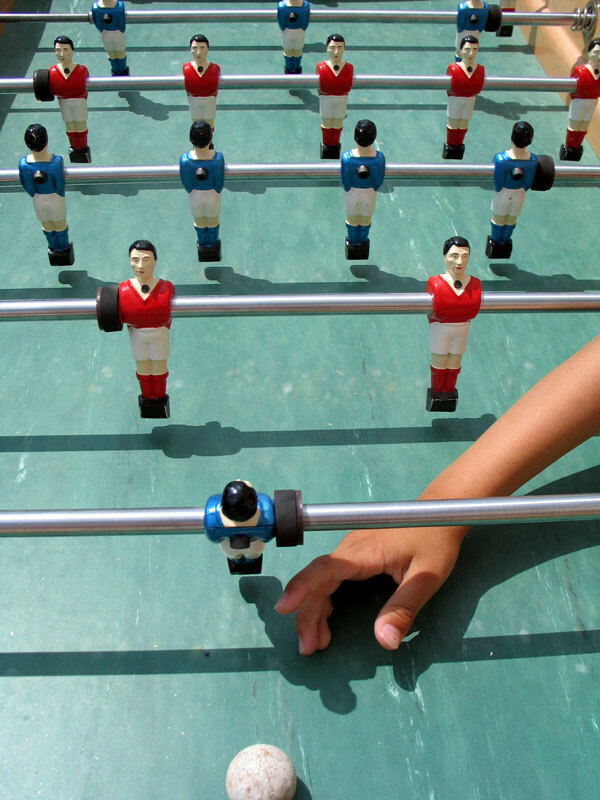 It is known around the world as; table soccer, baby- foot, or kicker, table football or foosball. Let’s first look at history a little bit. It was first invented in 1922 by Harold Searles Thornton and patented 1923. His love for the game of soccer, and more so the team of Tottenham Hotspur of England, led him to invent the game. The concept was that everyone who loved football would have an equivalent soccer game to play at home; hence, the table version was made; foosball was made. Playing foosball is not just a game for passing the time. There are many professional foosball players and their seasonal tournaments attract hundreds of players. The spectators range within the thousands if not hundreds of thousands; so you would consider foosball a serious sport or game depending on what side you are viewing it from. If you are looking for a foosball table and other accessories check our homepage. Learning to play foosball is simple as well as it can be hard, but don’t worry we will help you if you are having problems with the question how to play foosball. For beginners, it is important to master the basics at first and then graduate to the most advanced stages of the game. The key to becoming an expert at playing foosball is, to begin with, rules that govern tournaments; and even then it will take you years to master all, most or even some of the rules. Here is also one interesting book – beginner’s guide to foosball/table soccer. Once we are all beginners, but with practicing we can become experts! Flip a Coin. This is the key to fair play in foosball. In tournaments, the coin is flipped to determine which team serves the ball first. After a goal is scored, the team on which the goal is scored gets to serve the ball next. During play, the foosball must be touched by one man or player, before it is determined to be a goal. No Spinning. Spinning is when the rod completes a 360-degree turn without ever touching the ball; this is considered illegal, so no spinning is allowed. Jarring is if a foosball player slams the rod that he is playing with against the wall to jar or distract the attention or steal the foosball from their opponent. Careful attention is given to this rule; because it is allowed for players to move their rod during play to play the game. Jarring is a deliberate act which is not a part of the rules. Dead Balls are foosballs which stop in play between the rods of any playing team. When this occurs, the ball must be humanly picked up and served by the team that the goal was scored on. On the defensive team, if a dead ball occurs, the player is allowed to move the ball back into play. This is done once the ball stops behind the defensive 2 bar. Out of Play Ball. This is when the ball either shoots from the foosball table to the floor or lands or hit the top rail of the foosball table. The ball is re-entered into play by the team in which the goal is last scored. The 5 Bar Passing. This is reserved for tournaments; however, if you are an avid foosball player and understand the concept and technique then it is ok. It is a difficult play and takes a while to master. Mentioning the 5 bar play is to get you familiar with the most complex areas of playing foosball. It requires precision timing and playing between the 5 bar and the 3 bar to execute this play. Learning this play requires some research and practice, so don’t be daunted. We have also found a video for you, so you can learn the rules of playing foosball better. Take a look at the video below. The position of your feet for playing foosball is very important. Yes… there is a correct stance for playing foosball. Just as having the correct stance for playing golf, it behooves you to learn the correct feet positions even though you are a beginner. This will give you enough freedom of movement during play. The experts indicate you to stand at the foosball table with your left hip to the table while your right foot is positioned at an angle diagonally to the table. This position gives you more room for arm movement and allows greater impact with working the rods. If you notice the rods are positioned with some longer than others, so having a good position will enhance play. Experts recommend when playing foosball that players do not hold the foosball handles too tight. For persons who play baseball and tennis, you need to have a firm grip on the handle of the bat as well as the handle of the tennis racket. For playing foosball this is not needed. Golfers will grasp the concept as they require a certain amount of finesse to hold the golf club during play. The principle for foosball is the same. The French have mastered this technique quite remarkably, so they are able to play a more refined foosball game. There are two kinds of holds for gripping the foosball handle that you need to study. After learning the two, you are able to employ either when executing any shot or play. The two grips are; the Traditional Shot Grip and the Open Handed Foosball Grip. Mastering these two grips will improve your game whether you are an amateur or a beginner. Another secret to getting a good grip on the foosball handle is to wrap them with tubing or wraps. This gives the right amount of stickiness to enable a good grip on the handles. For players, they need to experiment with these to see with which they are most comfortable. Next, we are going to look at the best equipment for playing foosball. Apart from investing in a very good or high-end foosball table; it is important to also invest in the best equipment. The balls, replacement playing men, rod bearings, safety end caps, table covers, rod silicone, entry dish, and roll pins are just some of the equipment to invest in. These choices are just some of what is available. Don’t wait until your equipment is old and worn before you replace them. Being able to enjoy a good game of foosball is dependent on you having the best equipment available. Have fun learning to play foosball with family and friends it is a great way to pass the quality time, which is memorable. Do you have anything to add or have any question left? Feel free to contact us here.